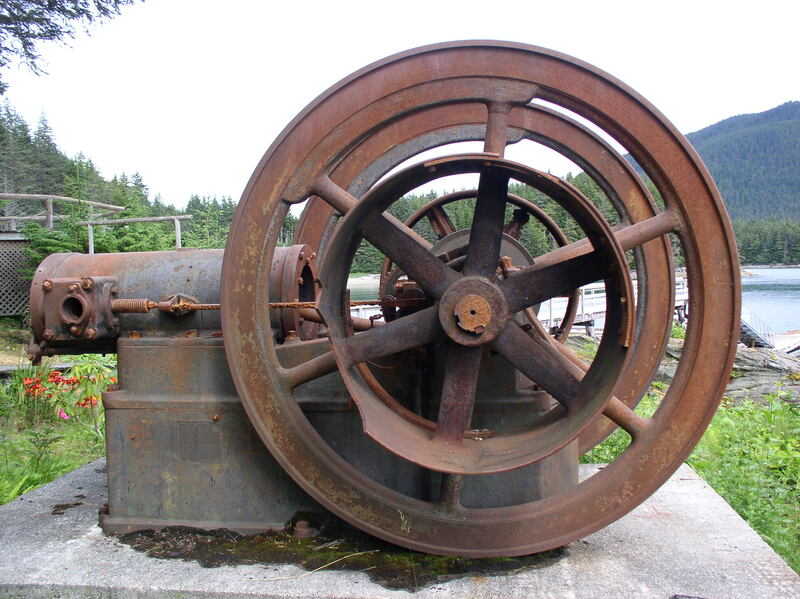 Most of the industry in Funter Bay required power of some kind, steam was the major power source prior to cheap and reliable internal combustion engines, but early gas and diesel engines began arriving around the turn of the century. 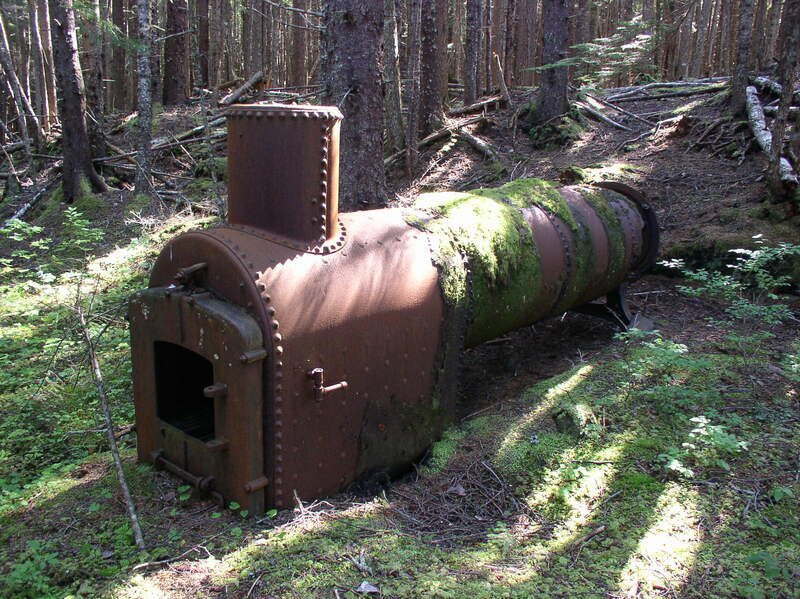 You would think that in the middle of a forest, the best fuel for steam engines would be locally-cut wood, but coal seems to have been used instead (you can still find chunks of coal on the beach in a few places). Whether this was due to the design of the boilers, the thermal properties of spruce, or due to lumber harvesting restrictions, I’m not sure. Oil was also an option for fueling boilers (there was a whale oil plant at Tyee, and early petroleum wells in Southcentral Alaska). 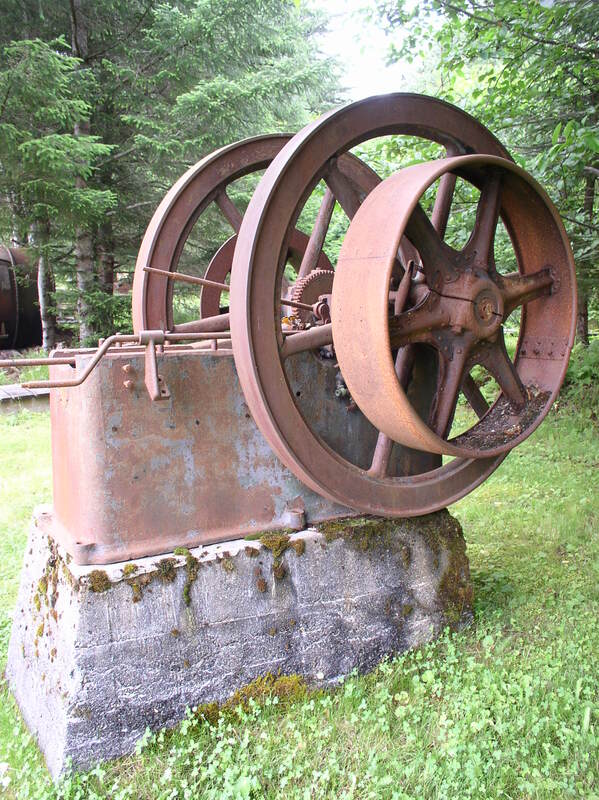 One document from the 1920s mentions that Killisnoo coal was preferable to oil as a fuel for steam boilers at Funter Bay. 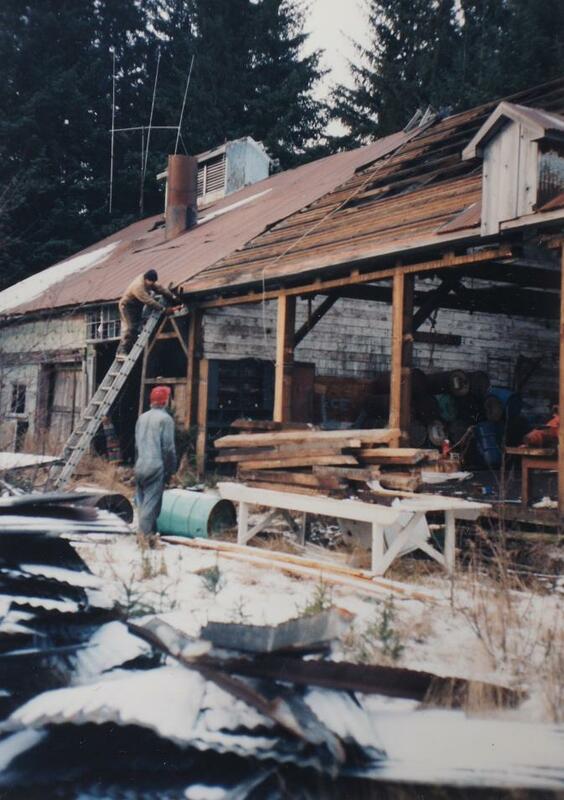 Coal was mined at Harkrader on southern Admiralty Island, near the fish processing plant at Killisnoo (now part of the village of Angoon). 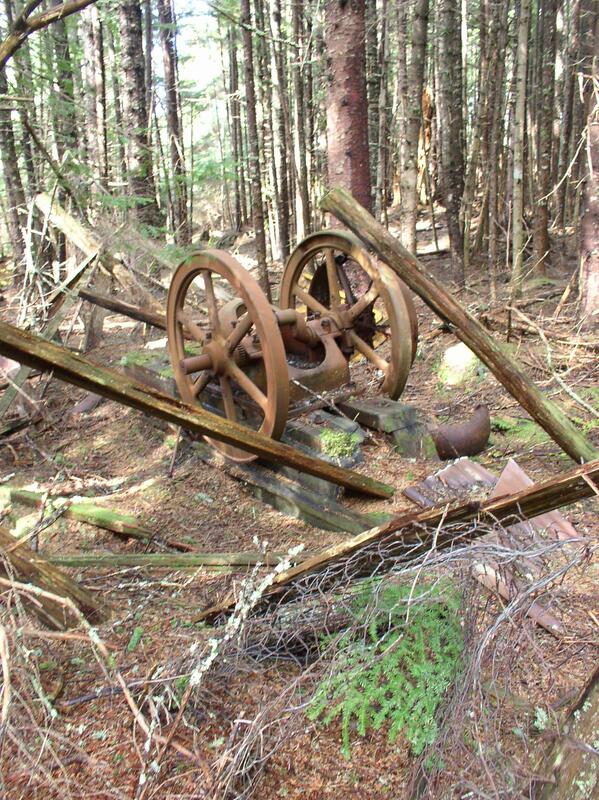 Discovered by Russian explorers, used by early Russian and American steam vessels, and mined intermittently until 1929 , this deposit was planned to supply Inside Passage steamships, but seems mostly to have been sold in local communities. Edit: The main engines at the cannery appear to be gasoline, rather than steam, see below. 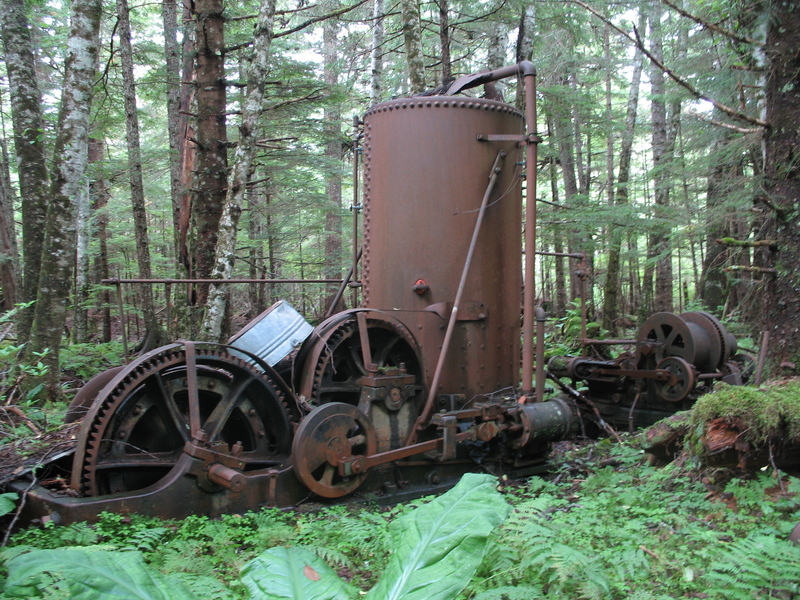 Large operations like the Funter Bay cannery had a large central boiler which provided steam for cooking and sterilizing, as well as heat and hot water for the sites. The two engines would have been located in the machine shop, with the boiler located in the power house. 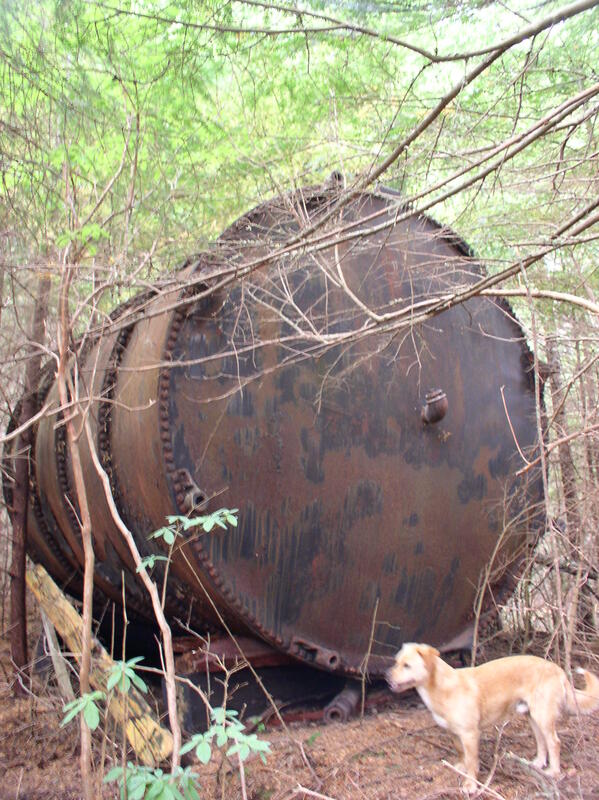 Two large tanks such as this held water for the boiler. 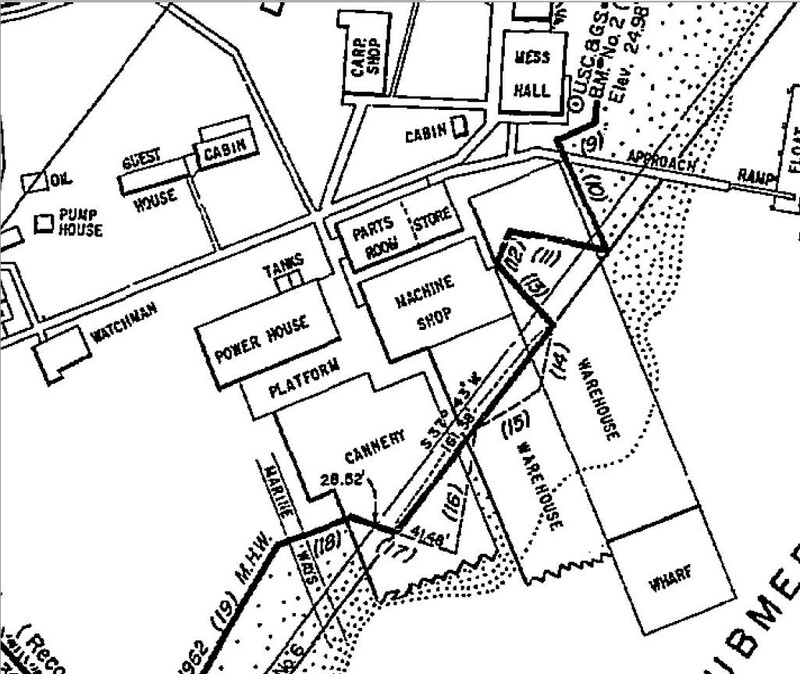 On the map above, you can see the tanks located behind the power house. Update: The tank below is in fact the one located behind the pump house on the above map, and was used for oil. The two tanks behind the power house were nearly identical in design. Update: after looking closely at my photos, I can make out what appears to be “Vulcan Iron Works” of Seattle. 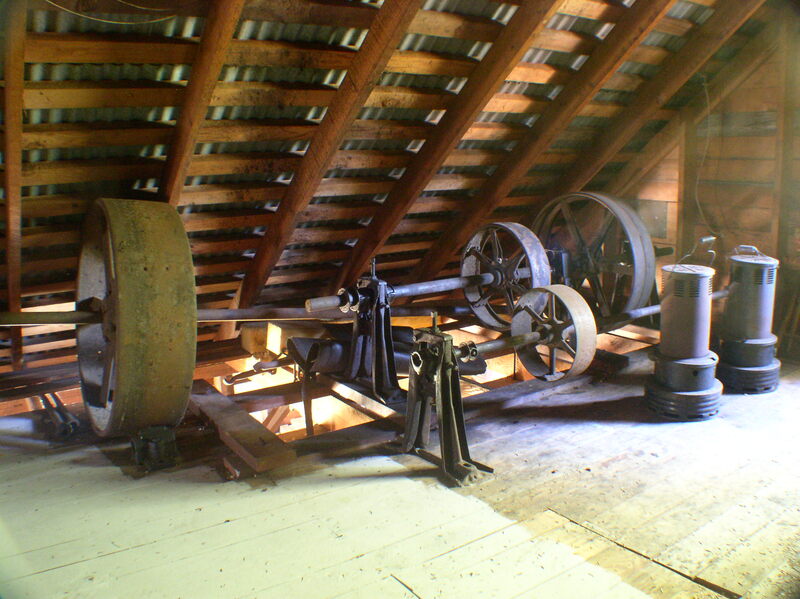 Here are some photos of a very similar Vulcan steam donkey, built in 1901. A smaller and slightly newer (3hp?) 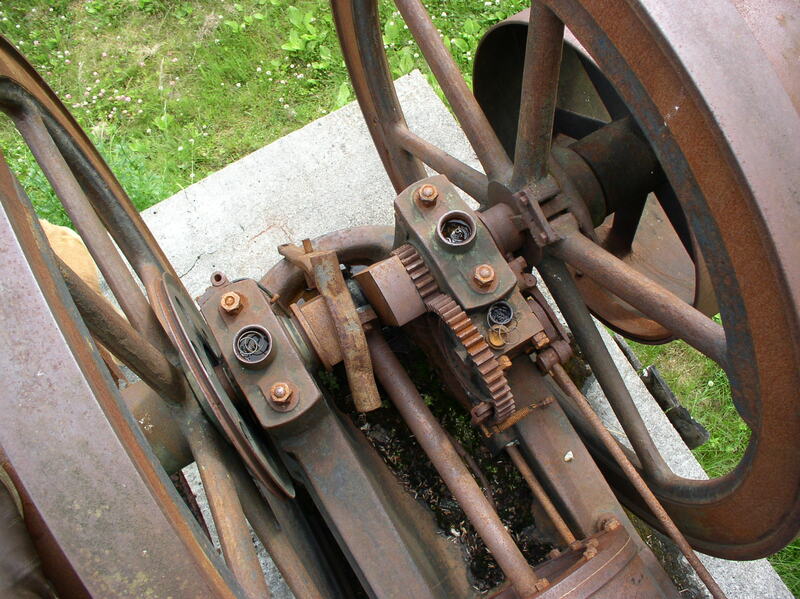 gas engine, similar to the ones shown here. Thanks to Gordon Harrison for providing some additional details! 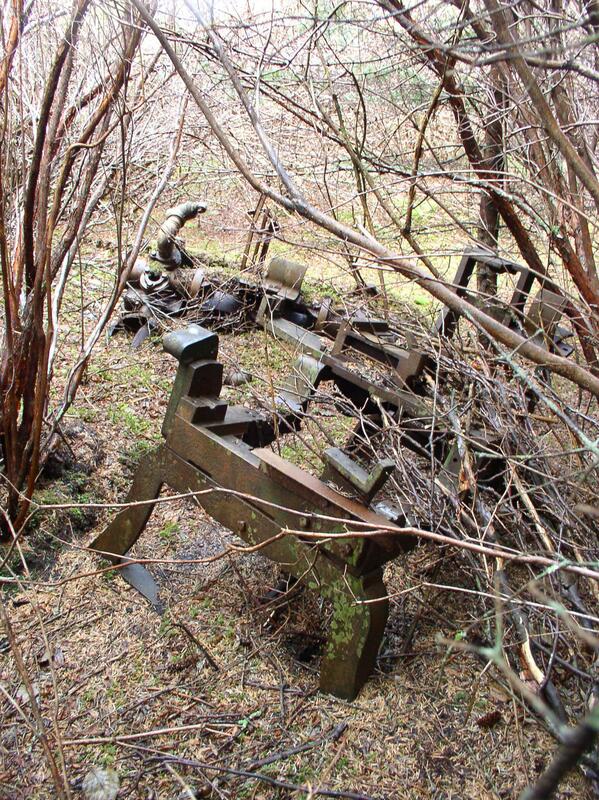 This entry was posted on Tuesday, April 23rd, 2013 at 11:00 am and is filed under Funter Bay History. You can follow any responses to this entry through the RSS 2.0 feed. You can leave a response, or trackback from your own site. 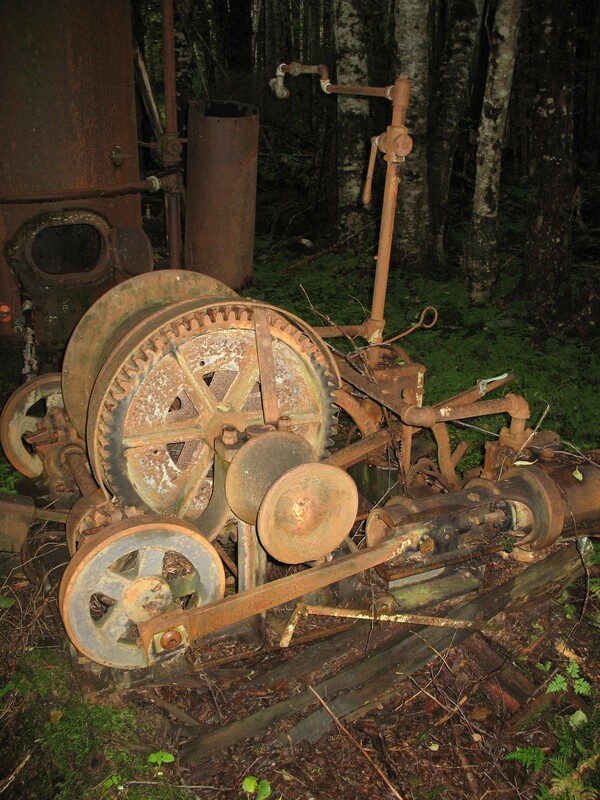 The steam donkey looks a little like a Lidgerwood but many details do not match. Do you have photos of any markings on it? I’ll see what else I can find as far as photos of that unit, I’m not sure if I have any of markings. 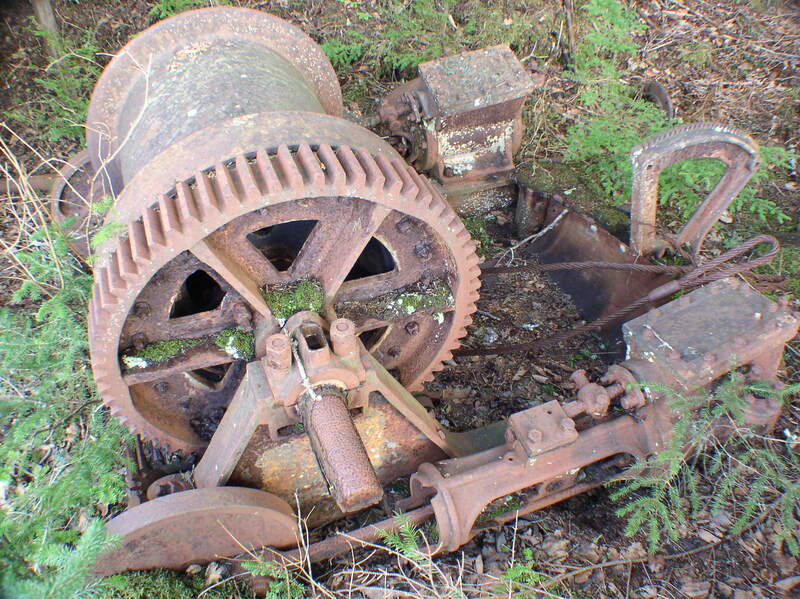 In looking closer at the steam donkey it looks to have a name cast into the frame behind the crank. The last line looks to read: SEAT (Seattle?). 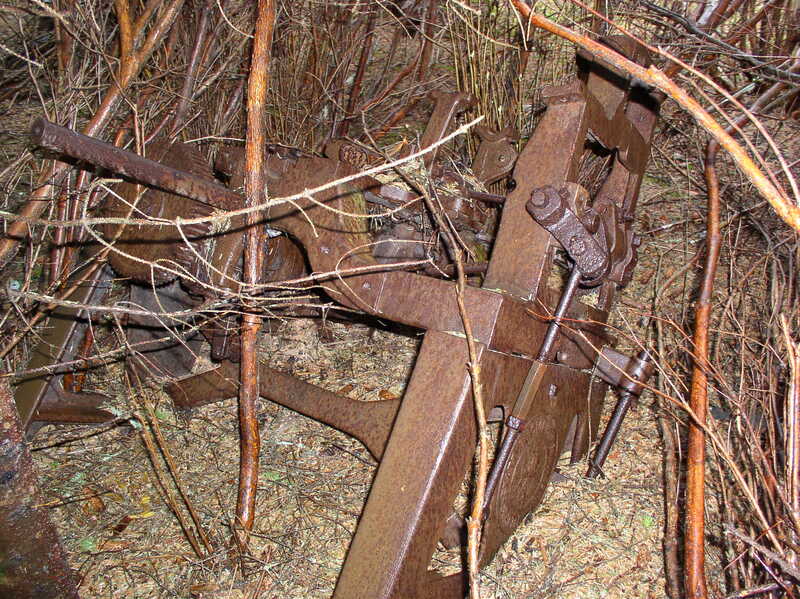 This may be a rare surviver from one of the small, short lived builders. The Funter Bay donkey is a rare one! I only know of three other Vulcan donkeys in existence. Bellow is a short history of the company. Originally known as the Allmond & Phillips Foundry the company was started in 1885 at 2nd and Washington. The firm was incorporated in 1889. This firm became the Vulcan Iron Works in 1892 and was located between Union and University streets on Seattle’s waterfront. 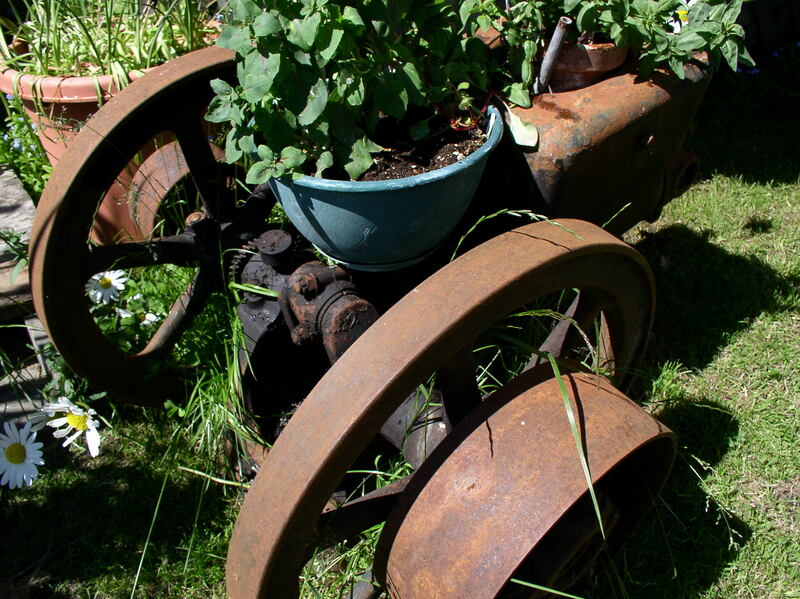 (56) Donkey production started in 1898 or 1899 with C/N 1, a 10X12 two-drum roader. In 1898 the plant was moved to 5th Ave. and Seattle Blvd., a site latter occupied by the yards for the Union Pacific depot. The bulk of the business was marine and general metal work of all kinds with donkeys as a small part of their production. Seven donkeys were under construction in August 1900. As of April 1901 only 45 donkeys had been built. By June 1909 construction was under way on a new plant located at the SE corner of 4th Ave and Connecticut St. (Royal Brougham Way), now occupied by a Metro bus base. (57) At about this time Vulcan produced their only known locomotive. This odd machine took the gypsy idea to an extreme; instead of a locomotive with a winch attached this was a donkey with a small locomotive attached. (58) The name of the company was changed to the Vulcan Manufacturing Co. in March 1912. During World War I donkey production was halted and the entire plant was dedicated to marine work for the wartime fleet build up. 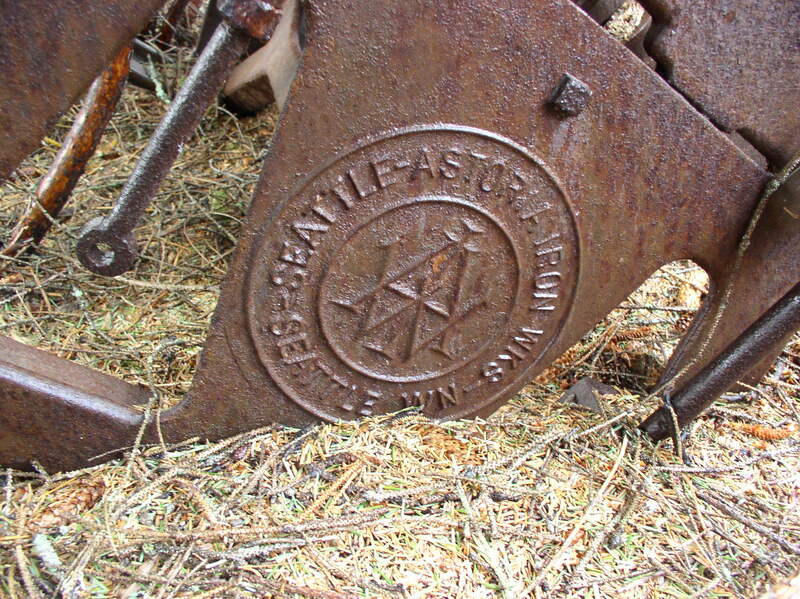 The most distinctive feature of the Vulcan donkeys is the company name cast into the crossheads. The machine at Buckley has a space for the engine number cast into the right valve chest but this is blank.